How do you refresh a folk story so well known, a Disney classic so well-loved? If you’re director Kenneth Branagh and screenwriter Chris Weitz, you do it one character at a time, rethinking and reimagining every aspect of the tale – and reassembling it with charm and care and more than a touch of pixie dust. The result: this movie in which there’s enough silliness and slapstick humor to keep the young ones amused – and enough smart writing and serious attention to detail to engage those of any age who appreciate a story well told. The original Disney animated version came out sixty-five years ago and, in its sensibility, this movie recalls those times. Branagh has brought a 1950’s feeling to this version – and it gives the movie a classic, even timeless feel. He’s also made other changes to include different perspectives and points of view – and they add depth and pace to the storytelling; but the biggest change is this: This version is – gasp! – not a musical. Still, the story keeps the lighthearted tone that music added to the original Disney version. And listen for Disney classics over the end credits. Richard Madden plays an understated Prince. As the wicked stepmother, Cate Blanchett is sneaky and sinister – and persistently evil. Helena Bonham Carter brings a vacant look and confused sense of ditzy-ness that makes the fairy-godmother both helpful and fun. But this is Lily James’s movie and she glows in the leading role. There’s warmth in her voice, moonlight in her hair, radiance in her eyes. The Prince isn’t the only one in love with her. 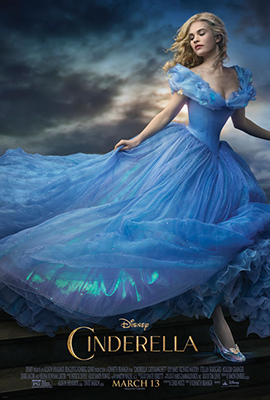 She’s a worthy Disney princess – and this is a worthy movie to carry the Disney brand. Don’t just drop off the kids; buy a ticket and join them. This is sparkling entertainment.